With an ever increasing focus on promoting more women leaders, it’s worth recognizing that certain styles are less effective in building the leadership brand for women in general. Part of effecting change is having courageous conversations. Read on! 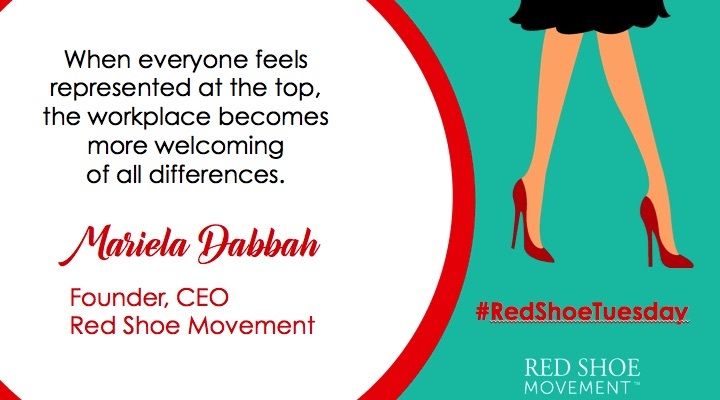 From the beginning of the Red Shoe Movement, we made sure our motto focused on “women supporting women for career success” so that we would take some of the narrative regarding women not supporting each other off the table. By keeping our eyes on mutual mentoring and mutual support, we hope to encourage many more women leaders in our organizations. 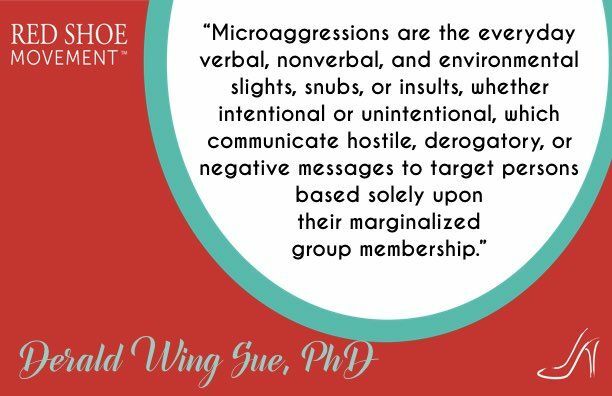 This helps avoid any distractions caused by the ongoing social discourse that women don’t support each other as the reason for the dearth of women leaders. For a long time, I thought my colleagues exaggerated when they talked about some of the women leaders they had the misfortune of working under. They described abrasive leadership styles that, instead of eliciting cooperation and loyalty, turned employees off. Then I ran into a person who fit every stereotype of the woman leader that I fight so hard against and I decided we had to talk about this issue openly. Because, whether we like it or not, women leaders are still a minority, and, as such, the missteps of one tend to affect the brand of the entire group. 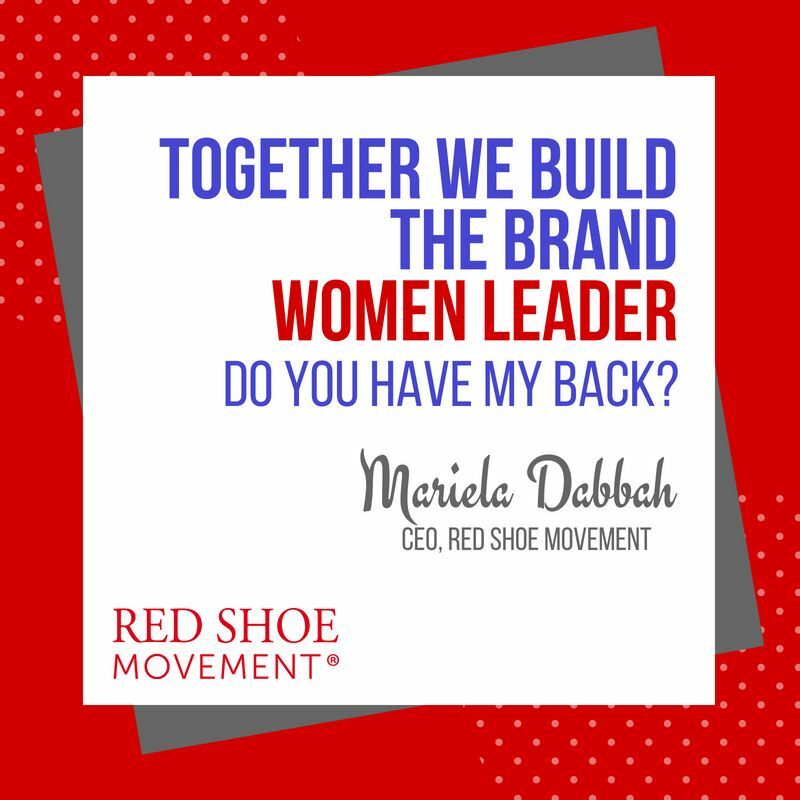 And what I mean by brand is the brand “women leaders” or “female leaders” as a whole. Just ask African Americans, Latinos or Jews about the ripple effect that a bad apple has on the reputation of the group as a whole. 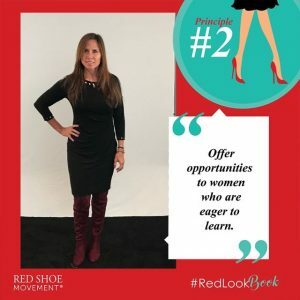 Although the styles I discuss on this post apply both to men and women, today I focus on the impact they have on my female colleagues. Here’s what happened to convince me to talk about this issue. After weeks of volunteering my time to help a friend (let’s call her Mary) organize a fundraiser to benefit an organization she supports, we were getting nowhere. Every time we got a leading professional to donate his or her services for an auction, the CEO of the organization (let’s call her Jen) would change things around without notifying anyone involved. As the date of the event approached, my friend Mary and I started to receive daily calls and emails from our professional colleagues who so generously had accepted our plea for their free services. They didn’t understand why their services were not listed on the event’s website, why the amount of consulting hours being auctioned was different from what they had committed to, or why they had been taken out of the event altogether despite having confirmed their participation. After one too many unilateral changes, I emailed Jen expressing how unprofessional this back and forth made us all look in the eyes of our contacts, only to receive in return a scolding letter on which she copied six other people from her organization. Needless to say, I was flabbergasted. I admit I should have called her to begin with, but my note to her was private. Her email to me was not. But the better question might be: Should we confront these women leaders with their misbehavior, or should we avoid them and move on? It’s no easy task to approach any powerful leader for a conversation about their leadership style shortcomings, but, in cases like the one in my example, not doing so carries an even greater risk – The perpetuation of the undeserved stereotype that women are not suited to lead. 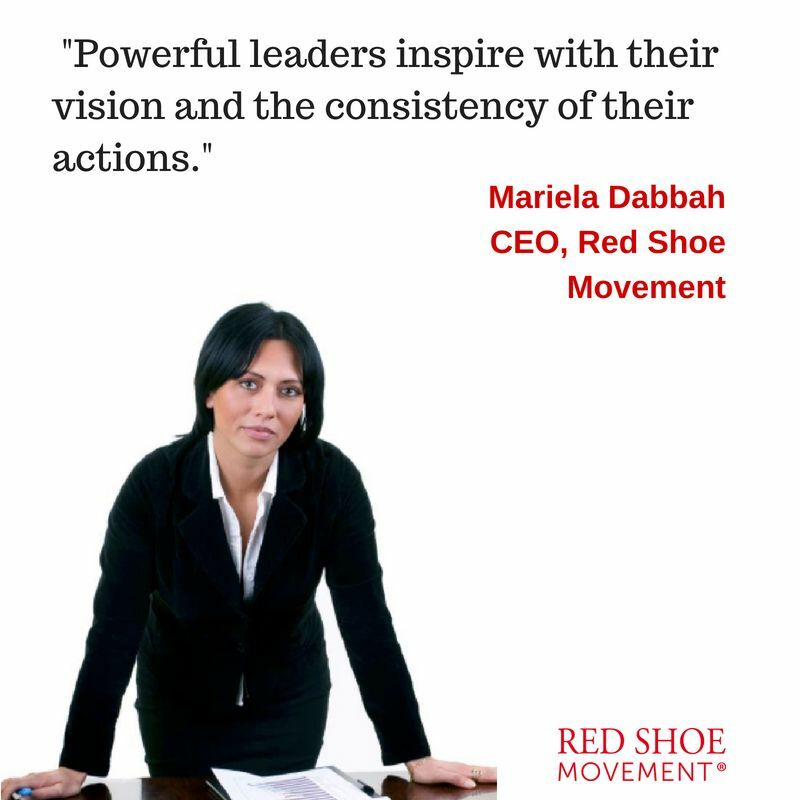 That all women leaders miss the mark. Micromanagers. Women leaders who can’t step out of their manager role and are constantly micromanaging their team rather than providing a vision and allowing their teams to carry it out. Queen Bee. These are the women leaders who feel there ‘s only room for one woman to shine in the organization and they systematically undermine other women, refuse to help them succeed, or are over critical of other women in the company. Emulators of male leaders. Women who rather than leverage their female traits alongside their experience, knowledge and skills, lose all femininity on the way to their powerful position in order to fit in. By emulating a masculine style, they play well in the boys club but tend to leave the culture of their organizations unchanged for women coming behind them. This is certainly one of those million dollar questions. It’s never easy to approach someone to provide this type of feedback. So here are a two suggestions on how to set up a productive conversation. 1If you have a good relationship with the leader, you could send a note saying you have a few insights that may help her get more support for her vision/project/etc. Then ask if she’d like to hear your insights. Giving the person a chance to accept or refuse your suggestions is key to avoid overstepping and creating a bad situation for yourself. If she accepts a meeting, prepare your feedback carefully. Focus on objective performance and results rather than personality. 2If you’re not too close to the leader, identify who has her ear. (Who does she provide air cover to? Who does she agree with at important meetings? Etc.) It may be best to speak to that person first and get a sense of the most productive approach to take. That person may even suggest that he/she is the one to bring up the issue with the leader. For this to happen effectively, you have to trust the person who will carry your observations to the leader and make sure they won’t backfire. The truth is that we are joined together in the guardianship of the brand “woman leader.” The success of one is the hope for all. By the same token, the failure of one impacts us all. So, as painful and difficult as it is, we must have these courageous conversations with our gender-mates when they are called for. Needless to say these feedback conversations should be held in private and conducted diplomatically in order to avoid eliciting a negative reaction. 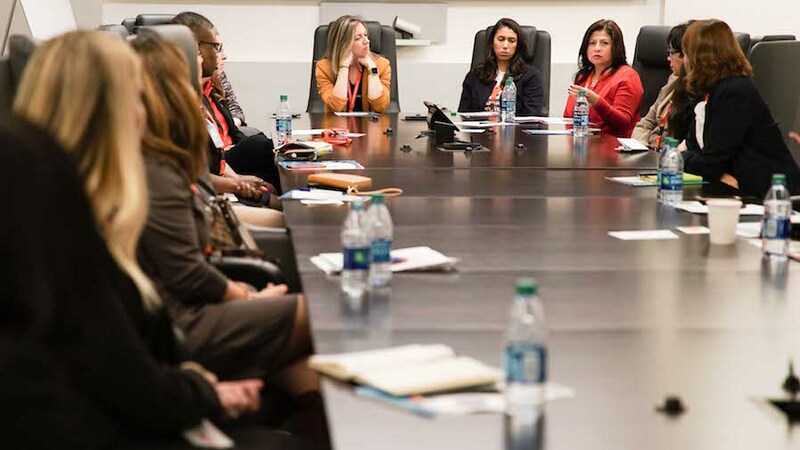 Unfortunately, avoiding the discomfort of having these conversations will only hold us back on our quest to see more great women leaders at the helms of our organizations. Who would’ve told Nathalie Stevens that mutual mentorship would be responsible for placing her among the eight finalists of a prestigious award? Yet, that’s how it went. 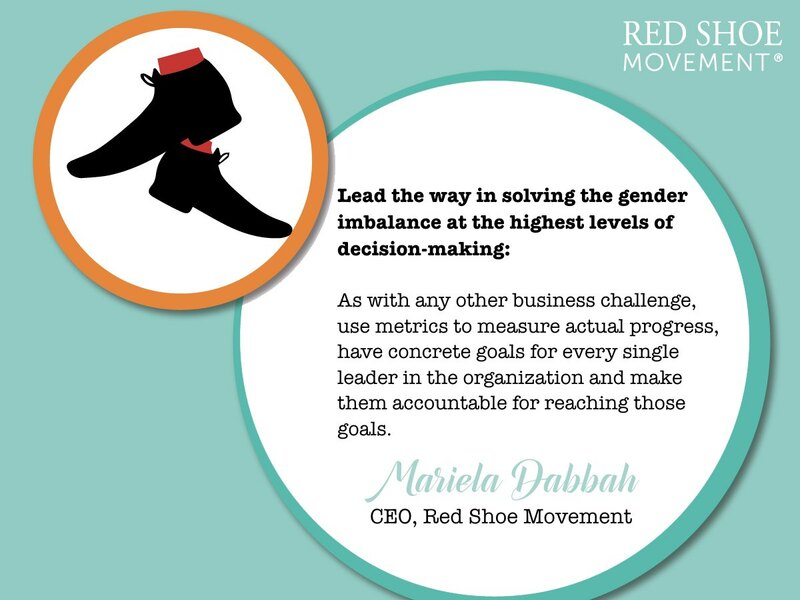 When attending the Red Shoe Movement Inter-Company Circle in Buenos Aires, Nathalie put in motion a process that placed her as one of the front-runners for $16,000 prize from one of the best-ranked TV stations in Argentina. When it was announced that Nathalie Stevens had been selected for the Abanderados (Flag-bearers) award (an annual prize that recognizes Argentines who stand out for their dedication to others,) she didn’t know whether to laugh or cry. She couldn’t believe she had the opportunity to amplify the work of her non-profit, La Fundación de los Colores (The Colors Foundation.) Her itinerant make-up school that prepares women who live in vulnerable neighborhoods to become professional make-up artists. 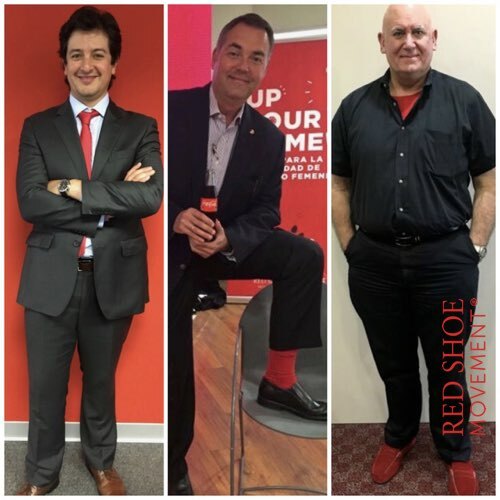 “The support that the Red Shoe Movement gave us is incredible! They opened many doors to us. The group is so generous! You really practice the 7 Principles daily!” Wrote Nathalie in a note to me after she heard she was a finalist. Although not unique, Nathalie’s is a perfect case study to use as an example of how our mutual mentorship methodology works. This is the methodology at the heart of all our programs. In this case, at the center of the Inter-Company Circles, a space where professionals of different companies meet to support each other’s careers. In Buenos Aires, where Nathalie story took place, the sponsor of the Inter-Company Circle is Novartis Argentina S.A., a global health company based in Switzerland. Their female talent from Canada to Argentina has been part of the RSM leadership development program for a couple of years. RSM Inter Company Circle in Buenos Aires at Novartis Argentina S.A.
Every month, a group of 15-20 business executives from various organizations along with members of the RSM team meet for about three hours at Novartis’ offices. They share their personal career challenges and exchange questions and advice with their colleagues. Facilitated by Gladys Benaim, Director of Business Development of Argentina, each Circle is unique since the agenda is set by the participants. It was at one of these meetings that Nathalie started down the path towards the Abanderados award. It happened when she brought along Verónica Barbera, one of the Training Coordinators of La Fundación de los Colores. Her moving story shook the group up. She had been a housecleaner for many years but after taking La Fundación’s makeup course she managed to change her life and become one of the program trainers. It was at that Circle that she met the successful Karina Mazzocco, TV conductor of Pura Vida, a popular show on Public Television. Moved by Veronica’s story of overcoming adversity, Karina invited her to be on her show. This, however, was not the only result of that mutual mentorship encounter. 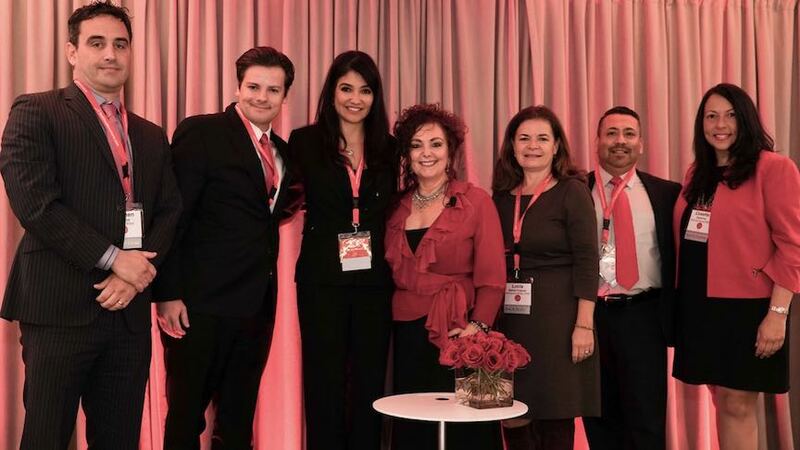 Inspired by Verónica’s story, María José Gómez Silva, the Novartis executive who champions Diversity and Inclusion in the LACan region, nominated La Fundación for the Abanderados award. 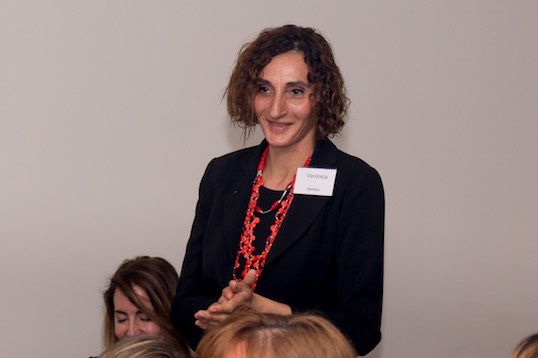 And so it was that through this process of mutual mentorship, where everyone gives and receives advice on their personal careers, Nathalie Stevens and her organization became finalists for the award. 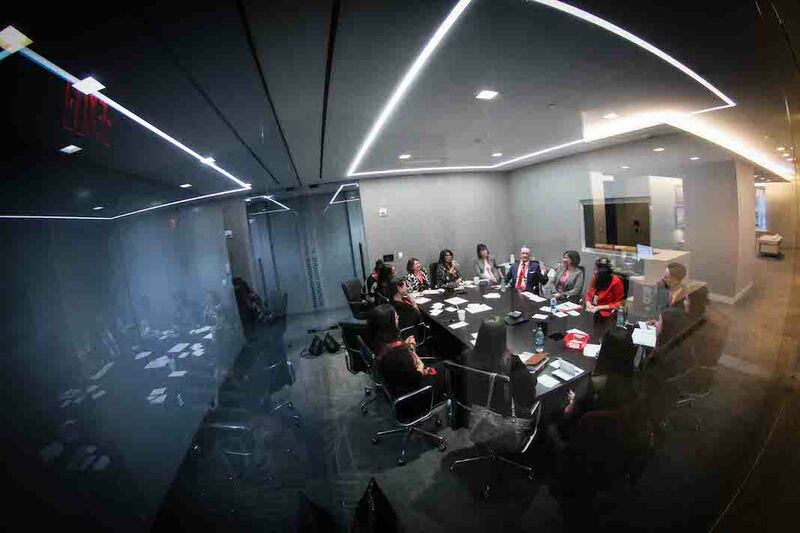 There are few places where women who are already leaders or are looking for leadership positions can exercise mutual mentoring with peers with whom they don’t work. Colleagues from other fields, and with other specialties that can contribute to their growth through honest conversations, while expanding both of their networks. The goal of our Circles is to provide a safe meeting space. Facilitated by a member of the RSM team trained in our particular methodology, they have proven to be a resource that enhances everyone’s careers. A similar model to the Mutual Mentoring Circles that you may experience at our RSM Signature Event (Featured here) you can experience in our Inter Company Circles. This Circle was facilitated by Ali Curi, at our 2017 event. 1A moment of personal reflection. This monthly meeting place in which attendees agree to maintain confidentiality, is a moment of reflection on their own desires, goals and challenges that participants face in their professional career. 2Recognition of one’s own wisdom and knowledge. 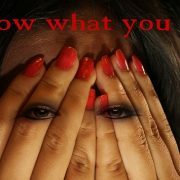 The methodology encourages everyone to ask specific questions to get help from the group. Making it clear that only each individual knows the right question to ask to help them move toward their own goals. It also asks for everyone to be willing to propose solutions and share experiences when it is their turn to help others. In this rich exchange, each participant identifies in themselves areas of knowledge and wisdom that they probably weren’t aware of. In turn, they find new answers that broaden their perspective. 3Increased self-confidence. As a result of practicing mutual mentorship, the participants of the Inter-Company Circle increase their self-confidence and the inclination to take on new challenges. 4Development and strengthening of everyone’s network. Regular participation allows for the development of strong networks among people who know each other’s background well, and therefore have a greater commitment and incentive to help one another. RSM Mutual Mentorship in action. This Circle was facilitated by Lucía Ballas-Traynor at our 2017 event. The participants of the RSM Inter-Company Circle are mostly women and men who work in large organizations. Given that our mission is to accelerate the representation of women in decision-making positions, we focus on this target. What is the benefit for the companies in which the participants work? 1Greater employee engagement. When individuals feel heard and find the resources to overcome challenges, job satisfaction increases. 2Generation of ideas. By sharing the specific challenges of their current positions as well as their long-term career goals, the participants exchange a host of inspiring ideas. 3Exposure to an effective model of diversity and inclusion. 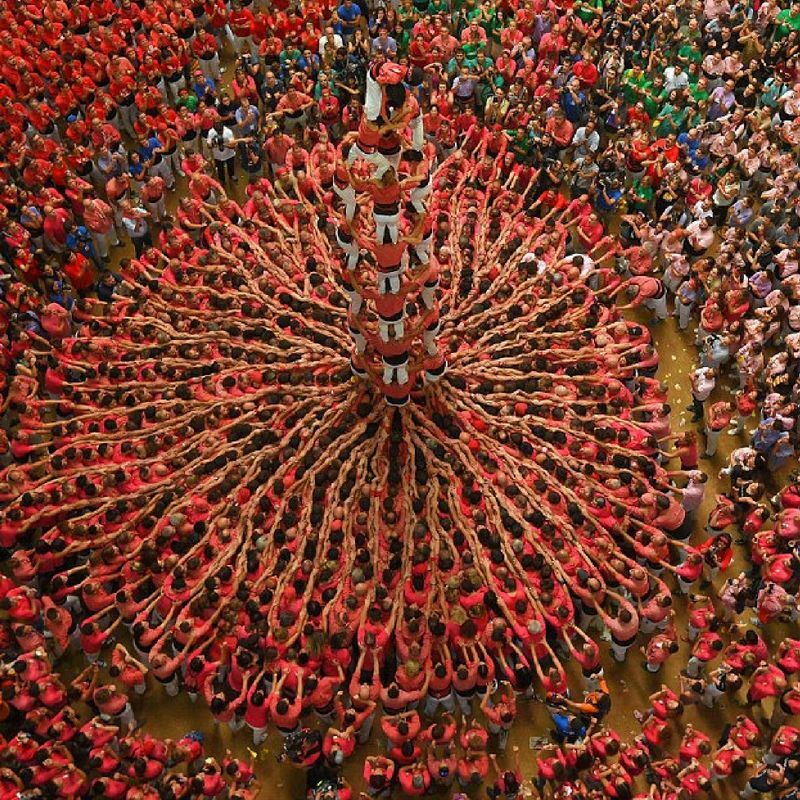 For the Inter-Company Circle to work optimally, a diversity of participants is required. Women and men in diverse functions, in companies that operate in a wide range of fields and cultures, have diverse educational backgrounds, social class, political, and religious inclination. Experiencing inclusiveness helps participants replicate this best practice in their workplaces. 4Amplification of the network. Strategic networks are the electrical wiring that facilitates our communications and interactions. The more solid and extensive, the better the results. This group is an excellent way to expand and strengthen the network within other leading companies. All of which encourages innovation. 5Ongoing leadership training. The fact that leaders of an organization meet consistently every month to talk about their own careers works as ongoing professional and leadership development. 6Personal agency. Participation is voluntary, which fosters the self-determination and self-leadership necessary to attend consistently. 7Inspiration. As a result of honest conversations and shared solutions, participants report being inspired by the mutual mentorship they experience at our Circles. 1Establish itself as a leader in Diversity and Inclusion in the market. 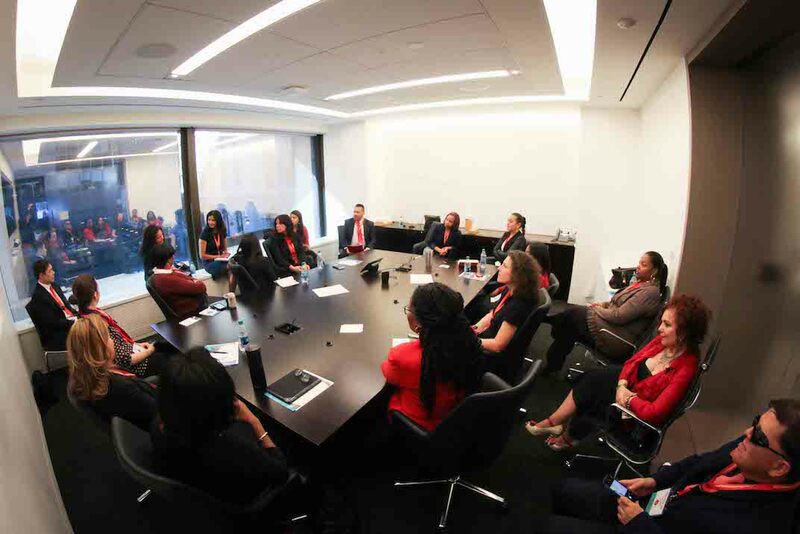 Being the host company of the Inter-Company Circle where colleagues from diverse fields meet monthly to exercise mutual mentorship, is an excellent way to project leadership in the D & I space. 2Talent magnet. 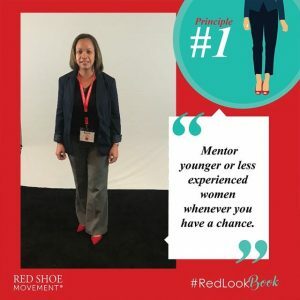 When the word spreads that the sponsor organization opens its doors to women and men of the most diverse fields with the purpose of enhancing their own careers, the organization becomes a talent magnet for both those who attend the Circle in their facilities and for those who learn about the initiative word of mouth. 3Strengthens Corporate Social Responsibility. Given the diversity of individuals who come to be part of the Circle, the sponsor has opportunities to leverage their CSR initiatives with Circle participants. A clear example is what happened with La Fundación de los Colores. 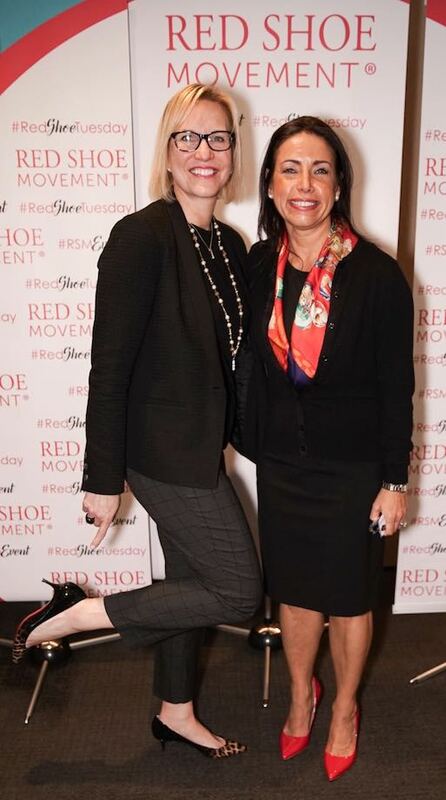 Nathalie Stevens and Karina Mazzocco met through the Red Shoe Movement Inter Company Circles where we practice mutual mentorship. Karina announced the winners of the Abanderados competition in a public ceremony that was televised. Here, she hugs Nathalie when she gives her the award. In the end, Nathalie Stevens didn’t win the $16,000 award. But the relationships she built, the exposure she gained and the amazing opportunities that opened up for her organization as a result of mutual mentorship and support are much more valuable. This is only the first step in a brilliant future for La Fundación. If you’d like to find out about hosting our Inter Company Circles at your organization, let’s talk! It’s always hard for those who haven’t attended, to figure out how a leadership development event can be so without speakers or workshops. Yet, our Signature Event is an experiential conference where participants develop their leadership skills hands-on . Here’s a taste of it. 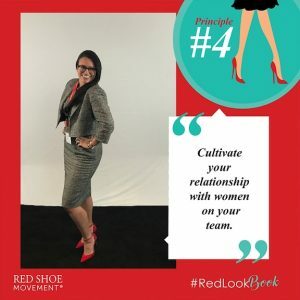 When I first sat down with a group of young women Ambassadors to imagine the RSM Signature Event back in 2011, I knew I didn’t want another leadership development conference with speakers, breakout sessions, panels and presentations. I wanted an experiential event. So from the get go, we created a unique format that fosters participation, a leveled playing field where everyone had a chance to teach and learn from each other, and a high level of energy. 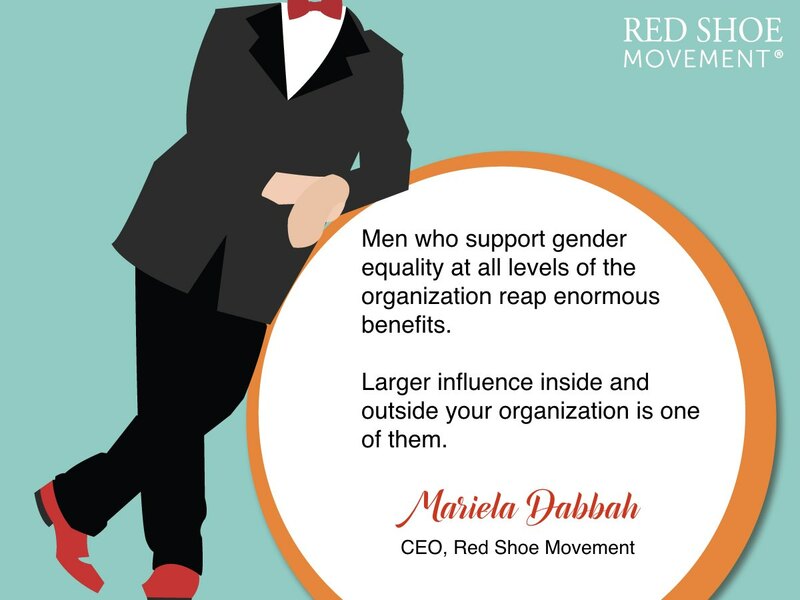 And given that the Red Shoe Movement is at the intersection of fashion and self-leadership, we wanted that extra oomph. We finally found it in 2015 when Farylrobin (designers for brands such as Anthropologie and Free People) became our event sponsor. For the last three years we’ve given away between 50-70 pairs of amazing shoes, specially designed for us, at early registration. In 2017 our event was once again, at MetLife, our Platinum sponsor for the fourth year in a row. This time, at their amazing new facilities by Grand Central Station! One of the hardest things to do when you organize an annual leadership development event is to resist the temptation of having a keynote speaker. It’s tough because it’s what most people expect, both the attendees and your keynote guest! You have to convince your guest that the interview format allows for a more relaxed, intimate conversation. 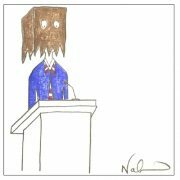 That makes for a much better experience for the audience as they get to see the vulnerable side of a leader they admire and hear insights they seldom hear in a straight forward keynote speech. 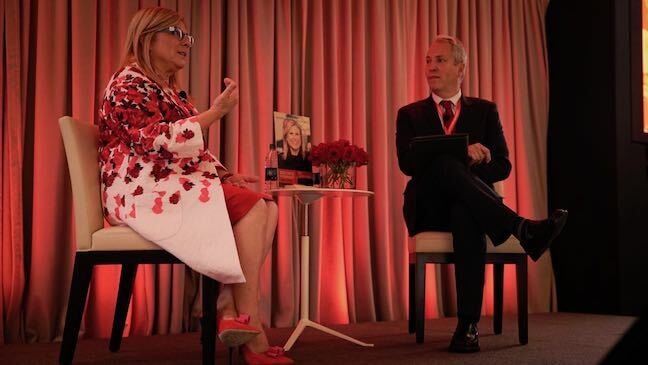 In our recent event, the keynote guest was Lisa Lutoff-Perlo, President and CEO of Celebrity Cruises, and one of the honorees of our 2017 Hall of Fame. Lisa was warm, honest, funny, humble… She shared some difficult times in her career in a way that made her completely relatable. After Philip Klint, Emmy-award winning, journalist, producer and anchor of NY1 Noticias in NYC, interviewed her, it was the audience’s turn to ask Lisa questions. And unlike any other leadership development event where people tend to shy away from the mic, this group had a bunch of incisive questions for her. In the final part of the session the guest asks questions of the audience. And so did Lisa, closing the circle of mutual mentoring we practice throughout the event. I spoke about our Mutual Mentoring Circles on another post but it bears repeating that they are at the core of our leadership development event. It’s a chance for participants to experience our methodology. 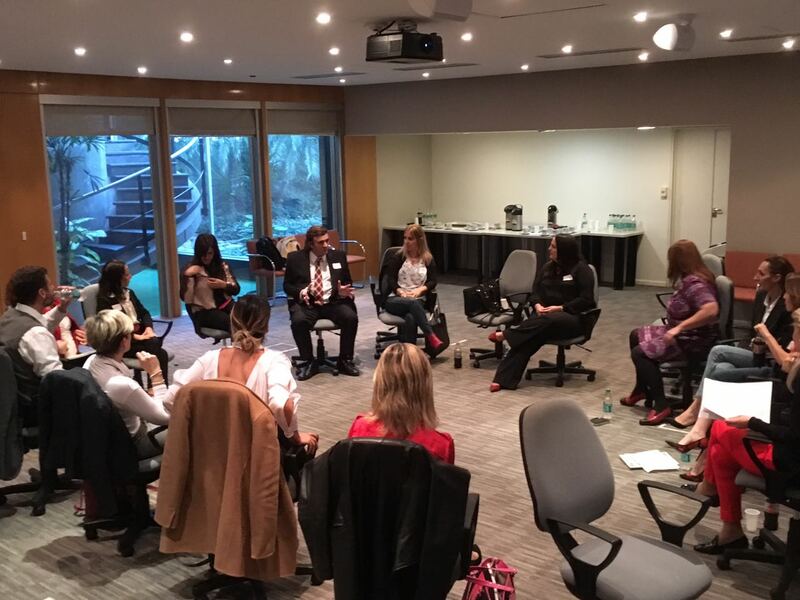 Right after the interview with Lisa Lutoff-Perlo, we went into two rounds of six RSM Mutual Mentoring Circles. 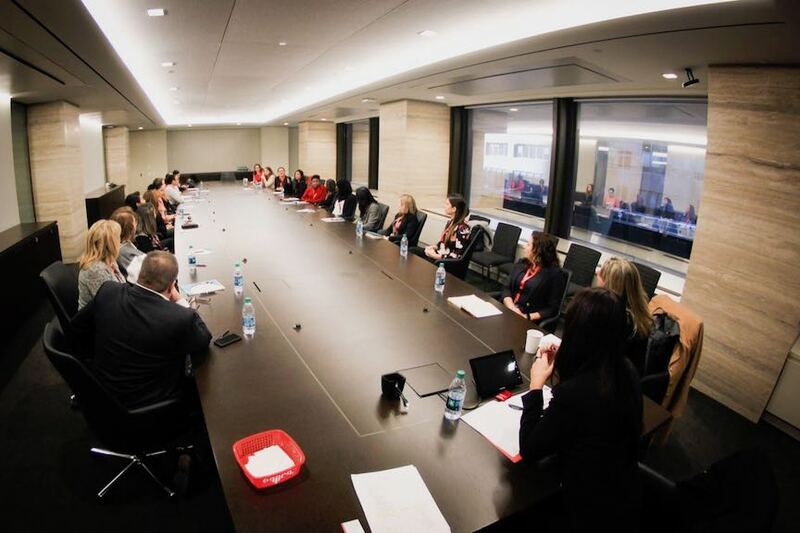 These are conversations about critical career topics, such as Your Brand Already Exists, Successful Negotiation Strategies, and so on, which were facilitated by six executives who are trained in our methodology. Judging from our facilitators own comments, these are among the hardest conversations to facilitate. The key is to let the conversation flow without sharing their own expert opinions. Which, as they are all senior executives with clear insights into each conversation, it’s a challenge. Lucía Ballas-Traynor, EVP Client Partnerships, Hemisphere Media Group, Inc.
Lily Benjamin, Global Talent, Organizational Development & Change Management, Bank of America. From Left to right: Stephen Palacios, Joe DiGiovanni, Lily Benjamin, Mariela Dabbah, Lucía Ballas-Traynor, Ali Curi and Cosette Gutiérrez. This year we launched our first Executive Circle. A group of executives who meets on stage to exchange personal questions and advice on the topic of the Importance of Learning from Failure. 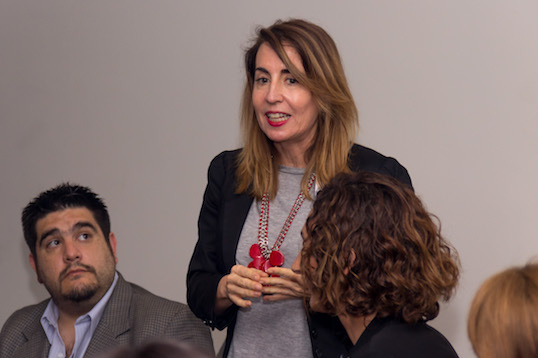 Moderated by our expert facilitator, Lucía Ballas-Traynor, the group alternated between asking questions about this topic and sharing insights and experience. Very much along the lines of what everybody had been doing doing the Mutual Mentoring Circles but this time, in front of the entire audience, fishbowl style. It was humbling to hear Katherine Blostein, partner at Outten & Golden, LLP, a NYC law firm, share her mother’s response to her news of not passing the Bar exam the first time around. “It was a mistake to bring you to America.” After which she hung up the phone on her distraught daughter. It was one of many moving stories that the circle participants shared with each other. “Eavesdropping “on this conversation inspired the audience to keep going, to trust their own abilities to reach any position they aspire to. At our annual recent leadership development event, the Executive Circle. From Left to right: John Basile, Katherine Blostein, Alejandro Barranca, Lucía Ballas-Traynor, Frank Gómez and Elizabeth Nieto. 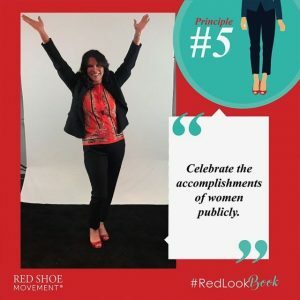 Inspired by the idea that everyone should find their “inner red shoes” as expressed in my book Find Your Inner Red Shoes, this year we launched our #RedLookBook booth. It is a space with a “red carpet” —which is actually black to help us highlight red shoes— where people flaunt their style. Participants choose one of the 7 RSM Principles and in the picture they appeared framed by that principle. It helps us continue to disseminate the idea that identifying your style is critical to your success. And I don’t just mean your clothing style but your style as a person. How you communicate, how you relate to others, how you resolve problems. And in a leadership development conference, this is an important insight to have. The four winners of the #RedLookBook won an experience at our sponsor Farylrobin’s studio where they’ll learn how shoes are designed and made. And of course they’ll walk away with a pair of shoes! If you ever put a leadership development event or any other type of conference together, you know it takes a village. People who during months plan every single detail so that they day of, everything flows seamlessly. 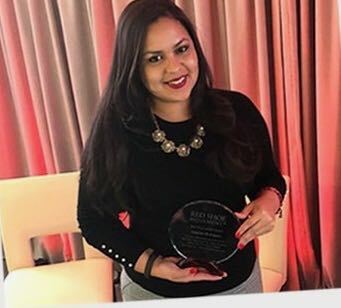 This year, we recognized Annerys Rodríguez, with our Red Shoe Leader award. She’s the Director of the Event and our oldest team member who is also our EMCEE. 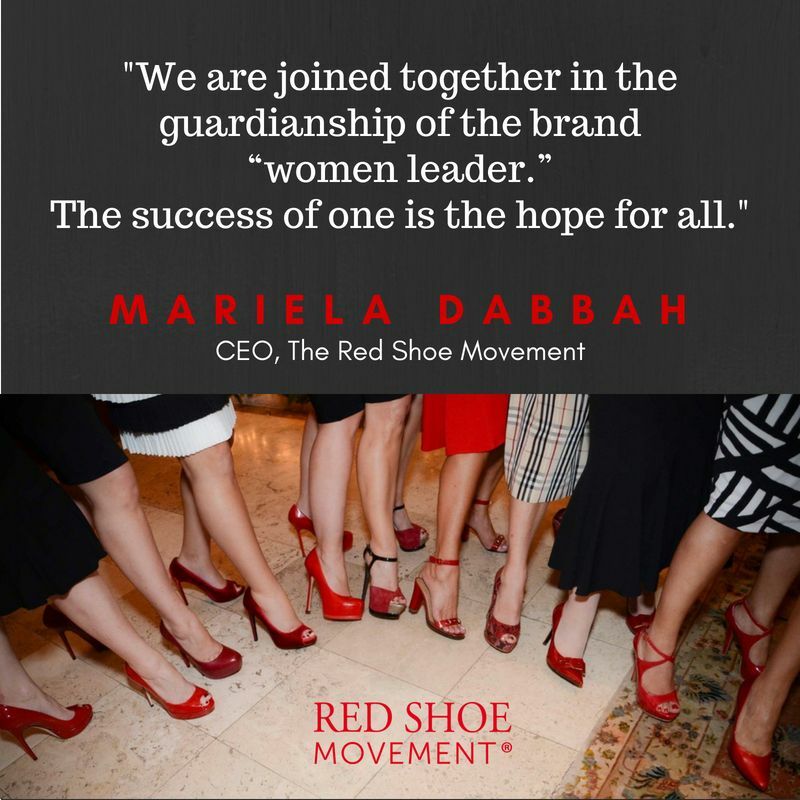 Since the beginning of the Red Shoe Movement she’s been behind the success of our Signature Event. Year after year she trains and leads a team of committed Ambassadors, young women interested in advancing their careers, who are part of our community. It is this team that makes the wheels turn at this unique leadership development event with a very demanding format. Ambassadors at our RSM Signature Event 2017- From Left to Right, sitting: Johanny Paulino, Cheyenne Vancooten, Concha Valadez, Annerys Rodríguez, Teresa Correa, Mariela Dabbah, Adrienne Loiseau. Standing from Left: Robin Bolton, Daisy Ortiz and Krystal Rodríguez. 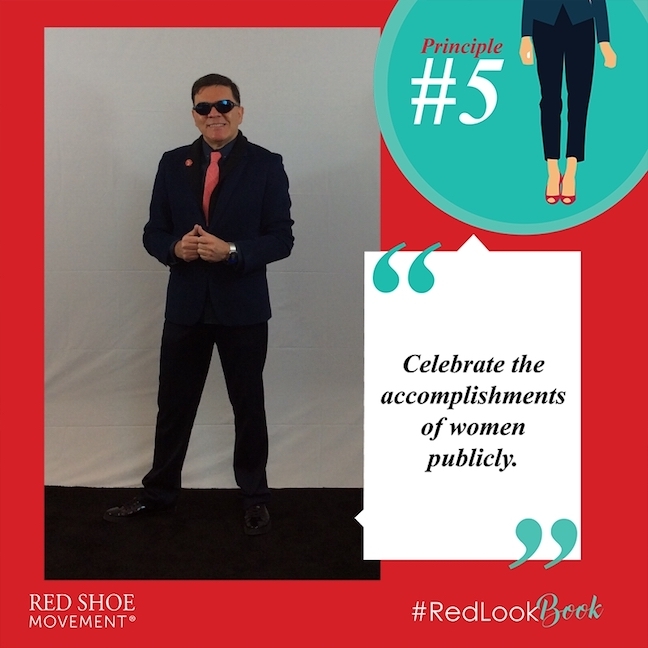 One of the key people on our team is Gustavo Carvajal, our #IDEAcatalyst, the person behind our communications campaigns like the #RedLookBook and innovative ideas that help us continue to grow. And we couldn’t have done it without Concha Valadez, part of our PR team, Teresa Correa, our first Head of Ambassadors, Paul García, our Head of Experiential. And our facilitators and Ambassadors who make this amazing day possible. And of course, a big part of the success of an event like this is due to our social media partners. The amazing people who help us disseminate the information about our event. 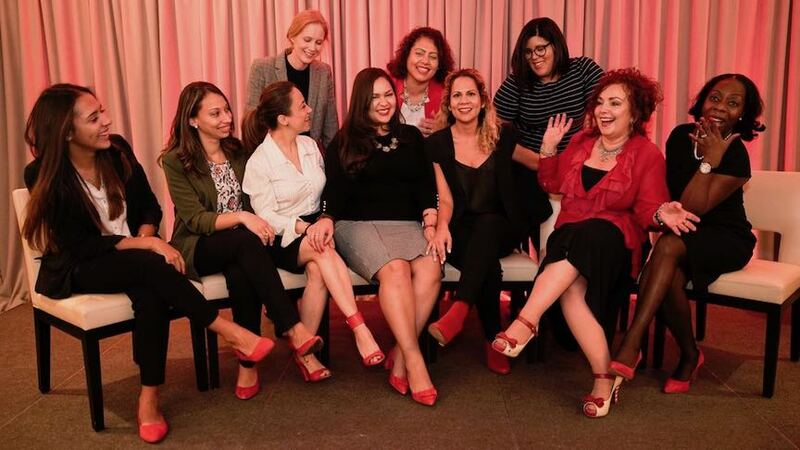 For that we are grateful to: LatinaCool who took over our social media and did a FB Live, Fairygodboss, the Latino Networks Coalition, Planet M, Latinas in Business U.S., Dreams in Heels, HPNG, Prospanica, and Latinas Who Travel. As phenomenal as this year’s event was, I have no doubts that next year it will be even better. Because we are a community whose members are constantly mentoring each other, learning from one another, we get feedback, we tweak and grow. And that helps us offer you a better experience every time. So we hope to see you at the 2018 event! And of course, if you want to bring this leadership development format to your company, drop us a note. 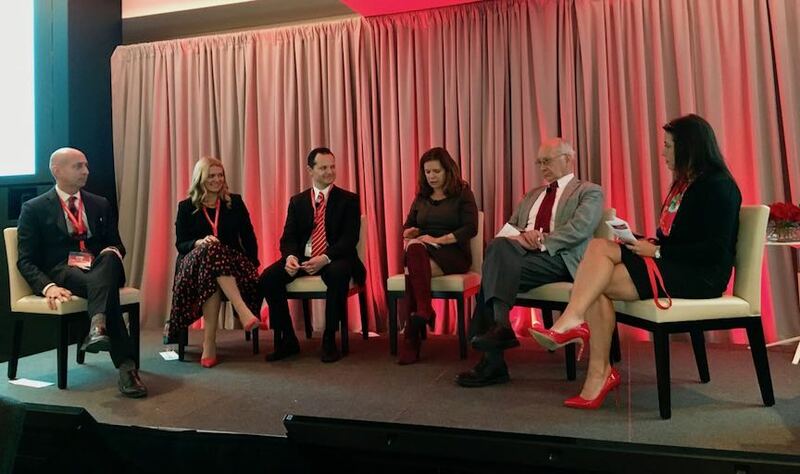 In a room full of women the handful of men who attended this breakfast with red ties and red shoes will be remembered by all of them. As the men who support women all the way to the highest levels of their company, these champions will reap benefits unavailable to those who stay on the sidelines. Let me be clear about my agenda with this post. I’d like to encourage more men to support women’s pursuit of decision-making positions by revealing what’s in it for them. Yes, many of us would prefer for men to contribute to leveling the playing field because it’s the right thing to do or the just thing to do. Or because they actually believe it benefits organizations and society at large. Or because having daughters have changed the way they see the world. But there’s so much that needs to be done to move the inclusion needle at the highest levels and so much to make any gains stick, that I’m not choosy. Be part of the solution because you’re convinced it’s a win-win for everyone to gain gender parity at the top or because you realize there are a lot of benefits for you in playing an active role. Either way, if you are in, we all win. We should be treating gender equality like any other business challenge. There’s a great opportunity for men who support women all the way to the top. Men who level the playing field have a huge advantage: They are in a minority. As such, you get a ton of visibility. In addition, we all know the power of espousing another group’s causes. It tends to lend credibility to the cause and to you as the one speaking up about it, as you’re perceived as having little to gain from supporting someone else’s cause. It’s why it’s always so effective when straight people support the rights of gay people, when whites stand up against injustices perpetrated on non-whites, and when Jews stand next to Muslims when they’re being discriminated against and vice-versa. So, whatever you do as a man who supports gender equality in the workplace you will attract attention to the issue and to yourself. You could be a strong catalyst for change (as Sergio Kaufman, CEO, Hispanic South America, Accenture clearly is,) by demanding that the gender issue be treated as any other business issue. With metrics that measure actual progress, by setting up goals for each leader in the organization and by making them accountable for reaching the specific goals. Hopefully 50/50 men and women all the way to the C-suite. Given the state of affairs in most large organizations, if you really wanted to make the achievement of gender equality your legacy, you could probably do it. 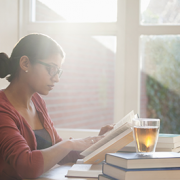 You could use the large body of research available to make the business case. The first step, however, should be to find out the real experience regarding growth opportunities of female talent across your organization. Discover areas of improvement, unconscious biases of the current leadership and all talent that may be affecting women’s possibilities to reach their full potential. In other words, do your due diligence as you would with any other business challenge. If gender equality were treated with the same seriousness as all other business issues, we would’ve resolved this crisis decades ago. Why not be the first in your organization and one of the very few leaders worldwide who is credited for having accomplished equality in a few, short years? 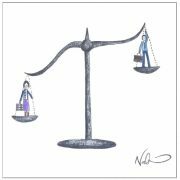 How long must we wait until gender equality is approached like any other business issue? If your goal is expand your influence outside your organization, being one of the few men who openly talks about this can give you a great story to share with the media. Obviously, you must first walk the walk. Make things happen in your company. Be the change you propose. Sure, you can talk about the importance of more inclusion at the top and the obstacles that get in the way and that, in itself, will bring you visibility. As I was saying, there are not enough men out there speaking out about this topic. But if you seek real influence, your actions, beliefs and words must be aligned. People, particularly those who work with you, will quickly turn against you if they feel you’re using this sensitive topic to attract attention to yourself while doing nothing to change the status quo in your workplace. At an in-house leadership training for Novartis Andean Region, men show up in red ties, socks and shoes to openly show support for women’s career growth. 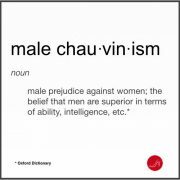 It goes without saying that once men come out of the closet as open supporters of women career growth those same women along with tend to reciprocate. They can become your strongest allies to help you co-create change in the organization and help you personally achieve your own career ambitions. As long as they see your intentions and actions sincere, they will become your advocates and contribute to building your reputation as a true champion of inclusion. The secret to develop this strong group of women supporters is to be equal partners. Leave any patriarchal instinct behind. Don’t support women’s career growth with thoughts of them needing your protection out of being weak. Or because you think they can’t do it alone. Do it from a sense of fairness. After all, you wouldn’t want to win a game of foosball because the table is inclined towards your side, would you? You’d want to claim you won fair and square because you’re the best player. That’s all women in the workplace have been asking. To have once and for all a level playing field so they can play with equal terms. So they can truly reach their full potential and go as far as they choose to in the workplace. If you are one of the executives currently leading the way in gender equality, let us know. We are already working on our 2018 Hall of Fame.